These printed circuit board images are provided for hobbists who want to attempt etching their own board. They are provided in the hope that they will be useful, but without any warranty; without even the implied warranty of merchantability or fitness for a particular purpose. These images are Copyright PJRC.COM, LLC. Distribution, Reproduction and Preparation of Derivative Works are permitted ONLY for non-commercial "hobbyist" use. No other Distribution, Reproduction or Preparation of Derivative Works is authorized. These black and white TIFF files are at a resolution of exactly 600 dots per inch. To obtain correct printing onto your transparency film, you must use software that prints the images at 600 dpi. The printed board size should be 5.75 by 4.00 inches (14.605 by 10.160 cm). The GIMP is an excellent free image manipulation program for Linux-based (and other unix) systems, which includes correct image scaling when printing (as of version 1.2). The GIMP 1.2 print dialog allow you to exactly control the printed size. If you use Microsoft Windows, there are many commercial image manipulation and editing programs, but I can not recommend any particular program (because I rarely use windows). Nearly all of the lines on this board are 15 mil (0.015 inch, 0.38 mm) wide, with 10 mil (0.01 inch, 0.25 mm) separation. The only exception is on the solder side where the connections are made to the 44 pin laptop drive connector. The board must be etched with a process that can reproduce 15 mil lines with 10 mil separation. Most hobbyist photoresist-based methods can acheive this if done properly, but iron-on techniques are questionable for this resolution. When assembling the board, many connections are made on the component side of the board. This poses a serious problem for soldering the PLCC sockets and SIMM socket. I used single-pin insert sockets, which are visible in the photo between the microcontroller and flash rom (the two smaller PLCC chips) and the large FPGA chip. They must be soldered on both sides for many locations, and soldering on the top is tricky, as a slight wrong movement will flood the socket with solder. These single-pin inserted sockets are available from Digikey, P/N ED5036-ND (Mill-Max P/N: 0548-0-15-01-1127100). Unfortunately, they are expensive, but there is little other choice (other than buying a bare board with plated-through holes). The insert pins also require 0.036 inch (0.914 mm) holes drilled on the board, and PLCC and SIMM socket pin diameter may not be larger than 0.023 inch (0.584 mm) to fit into them, so very careful drilling and carefully selected sockets are required to use this technique. Digikey should have a link to the mechanical datasheet for this part, if more details are needed. If you do manage to build the board by etching it yourself, please consider sending a photo or two to add to the User Photo Gallery. 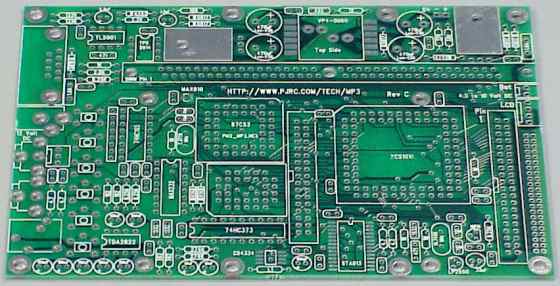 Because it is so difficult to fabricate and construct this board using a hobbist etch process without plated through holes, PJRC provides the bare board for $25. All rev C board from PJRC are electrically tested by the board manufacturer (an extra-cost option we pay for), so that your bare board will not have any fabrication errors that would impact the circuitry. We highly recommend that you purchase one of these professionally made and electrically tested bare boards, to give your project the best chance for success. 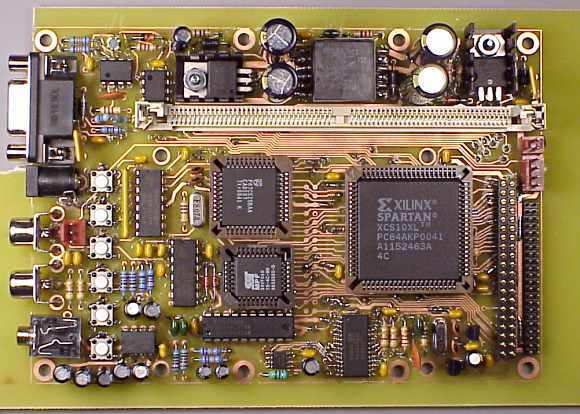 MP3 Player, PCB Layout, Paul Stoffregen.